Two of China's first entrants into the new commercial space launch scene have carried out tests related to engines and rockets for respective planned future orbital launch vehicles in recent days. 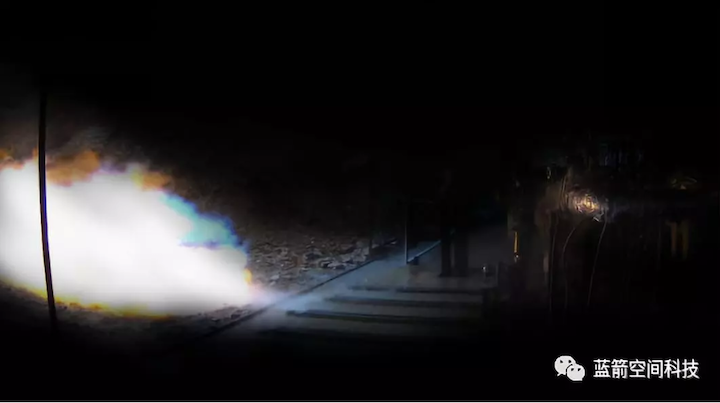 Last week Beijing-based Landspace test-fired a gas generator for its Tianque-12 (TQ-12) methalox rocket engine, an 80-tonne thrust engine designed to power the (ZQ-2) liquid methane and liquid oxygen launch vehicle, the company announced (in Chinese) on Monday. The test was carried out at a new 'intelligent manufacturing facility' in Huzhou, where the test-firing of the combustion chamber for the TQ-12 engine was also performed in September last year. The two-stage Zhuque-2 launch vehicle will be 48.8-metres tall, have a 3.35-metre diameter and be capable of delivering a 4,000-kilogramme payload capacity to a 200-km low Earth orbit (LEO) and 2,000 kilogrammes to 500-km Sun-synchronous orbit (SSO), powered by 80-tonne and 10-tonne 'Tianque' methalox engines. Landspace in November secured 300 million yuan (US$43.2m) in B+ round financing for the development of its Zhuque-2 rocket, which it aims to debut in 2020. The progress follows the failure of the company's first launch attempt, in October, which was due to an issue with the third stage of the Zhuque-1 solid-fuelled rocket seeing the payload failing to achieve orbit and plummeting into the Indian Ocean. Linkspace, meanwhile, has tested a tech demonstrator reusable rocket similar in utility to the Grasshopper rocket SpaceX used in its development of the Falcon 9 launch vehicle. The RLV-T5 technology demonstrator, alson known as 'NewLine Baby', for vertical takeoff, vertical landing (VTVL) is designed to verify key technologies including variable thrust, multiple engine restarts and roll control with its flight and recovery tests, according to the press release (in Chinese). The latest footage, released on Sunday, shows a tethered test which followed three months of preparations. The demonstrator is 8.1 metres high with a mass of 1.5 tonnes and uses five variable thrust engines. Linkspace now describes itself as the world's third-largest recyclable rocket development team, after SpaceX and Blue Origin. A social media post reaffirms that a suborbital test is planned for later in 2019, with the RLV-T6. The test follows the development of smaller scale rockets such as the RLV-T3 for VTVL and hover tests performed early in 2018, which were similar to demonstrations by Masten Space Systems. The goal for Linkspace after the RLV-T6 is to debut the NewLine-1 orbital rocket ( 新干线一号/Xin Gan Xian 1) in 2020, with a recoverable and reusable first stage. The NewLine-1 two-stage liquid propellant launcher will be capable of carrying 200 kg of micro and nanosats to Sun-synchronous orbit up to an altitude of 500 kilometres. No clear specifications for potential NewLine-2 or later launch vehicles have been presented. Landspace, Linkspace and others including OneSpace and iSpace emerged following a Chinese government policy shift in late 2014 which opened the door to commercial small satellite and launch vehicle companies, with access to technologies being facilitated by the national military-civilian integration strategy. OneSpace and iSpace are expected to make their first orbital launch attempts in the first half of 2019, following a pair of suborbital launches each last year. One of a newer wave of launch and rocket engine firms, Jiuzhou Yunjian, in December (Chinese) tested a combustion chamber for a 10-tonne thrust methalox engine. The China Aerospace Science and Technology Corporation (CASC), the main contractor for the space programme, is also working on VTVL and reusability, with subsidiaries CALT and SAST working on recoverable Long March 8 and upgraded Long March 6 launch vehicles, as well as putting parachutes on spent boosters and parafoils on fairings. Footage posted on Sina Weibo, a Chinese microblogging platform, on Monday shows new tests for guidance and control, apparently using jet engines, for a future VTVL launch vehicle.